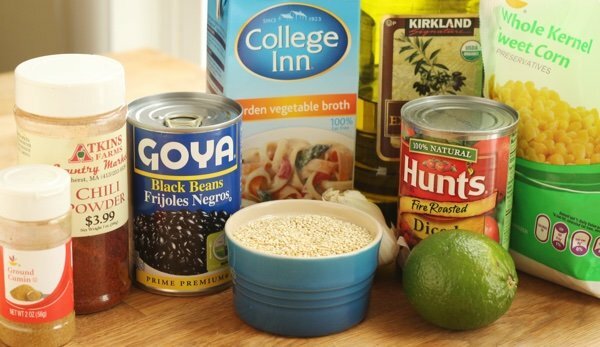 This Mexican quinoa recipe will change your mind about quinoa. For example, you may think quinoa (pronounced KEENwah) is not for you because it looks weird. Yes, it looks weird but you can use other things that look good like beans, corns, and tomatoes to make it more palatable. I used tomatoes, celery, and carrots in my slow cooker quinoa veggie chicken soup and it looked pretty good. You might also think it tastes like dirt. I know what you mean and I advise rinsing it before you cook it so it is more flavorless than dirtlike. I have found that mixing it with spices and flavorful foods turn it from bland bizarre food into a super food. Check out my healthy stuffed acorn squash which includes ginger, cinnamon, and cranberries = yum! Or you might think that you will hate it. 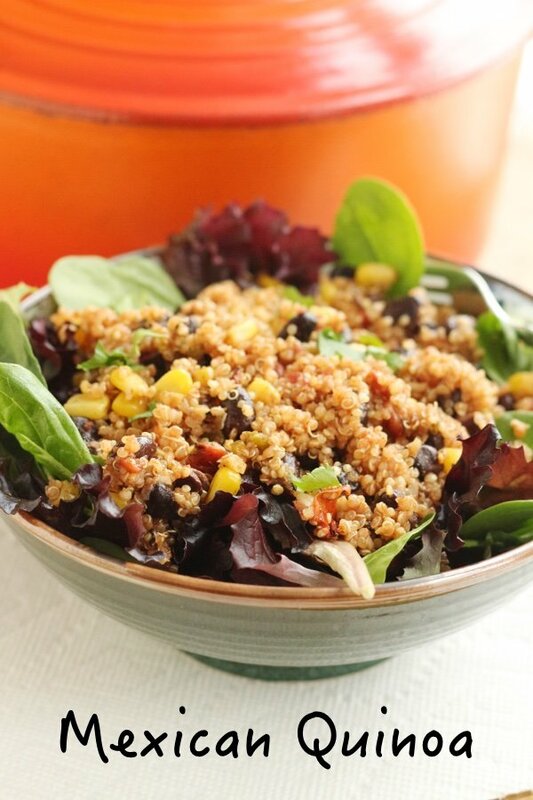 But, quinoa is a risk worth taking as it is packed with protein and SO easy to cook. It is easier than rice and a little faster. Look at how colorful you can make it! Once you get used to it, you will find it is comfort food. It has taken me years and I don't like quinoa in every dish – but I have become a quinoa fan. Right now, because of my high cholesterol diagnosis – this dish is my go to for lunch or a snack. Mexican quinoa is my replacement for meat chili. I layer it on some pre-washed mixed greens and hit it with my favorite hot sauce and lime. You really can’t go wrong with this. It is whole grain, no sugar is added, and it is packed with nutrients. Be aware that jalapenos really range in spiciness. I always taste mine (a little bit) to determine how much to use. Sometimes, I use the whole thing and sometimes I use half. If you find this is too bland, add more chili powder and cumin. I hope you love this recipe! Heat olive oil in a large sauce pan and saute garlic and jalapeno for one minute. 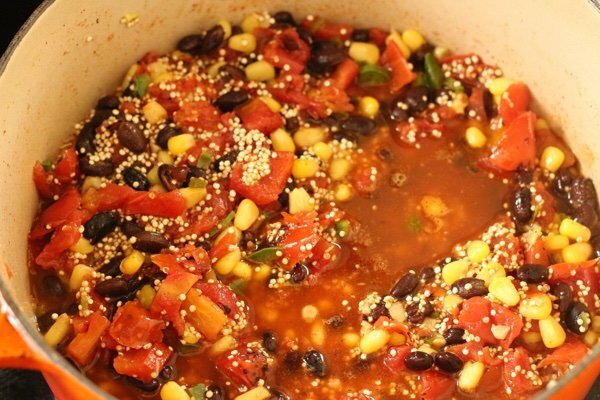 Add quinoa, vegetable broth, beans, tomatoes with juice, corn, chili powder, and cumin and season with salt and pepper. Bring to a boil, cover, and simmer until quinoa is cooked – about 15 minutes. Add optional garnishes and enjoy immediately or store for later consumption. Archer Farms/Target has a frozen quinoa blend that is also very good if your short on time. BTW, I subscribed to Slender Kitchen and also the Forks Over Knives sample plan for now and both have great quinoa recipes. Could you identify a serving size, i.e. number of cups? @Dianna - a serving is about 1.5 cups. thanks for your question! 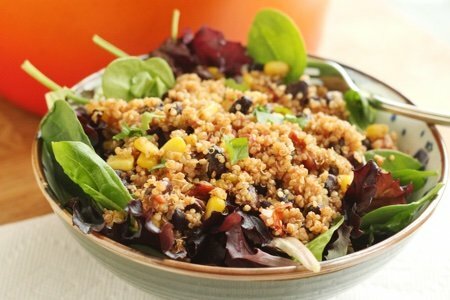 Quinoa is 71% carbs, 14% fat, and 15% protein vs white rice at 90% carbs, 2% FAT, and 8% protein. Many of the carbs are fiber but the two are so close in nutrients that I would opt to make rice which most people have in their pantry rather than quinoa. Also, traditional Mexican rice is never made with tomato products. In fact, tomato products can retard the cooking process of rice due to its acidity. Our Mexican family never uses garlic either. We use mild chile powder, cumin, and oregano, Instead of tomato products, cook the rice in chicken broth. Also, roast your rice in the pan before adding liquid. Here is how I make it: Roast the rice until it is white, add the herbs and spices and roast briefly until aromatic, add chicken broth and cook for suggested time. I use 2 cups of liquid to 1 cup of rice. If you want additions, they are not really traditional but add them after the rice is cooked. Roasting the rice first in a dry pan converts the starch and the rice will be fluffy instead of gummy after cooking. This looks great! I'll definitely be making it on my next cooking day. Thanks Lisa! Thanks for this recipe...I also got a high cholesterol diagnosis which surprised me as well...will try this one for sure.